Today we have a lovely giveaway from my dear friend, Anna of Mrs. Depew Vintage. I've sewn quite a few of her fabulous PDF patterns and am always so pleased with how they turn out! Although Anna specializes in rare vintage patterns, she just launched a new modern pattern, inspired by vintage unmentionables- the sweet and flirty low-rise "Ma Cherie french knickers" pattern- now available in a paper pattern and print-at-home PDF. Anna is currently working on this matching bra too! the winner will be announced next Wednesday! I love this! I've been a follower on Mrs Depew's FB page for a while now and now I'm here too! Love it! I was already a follower of A Few Threads Loose. Didn't realize there was a Mrs. Depew FB page too! I already follow both you and Mrs. Depew. She has such amazing patterns I would to try this one! Oooh, I just adore her blog! So happy that there's a giveaway- been dying to try a Depew pattern for months! 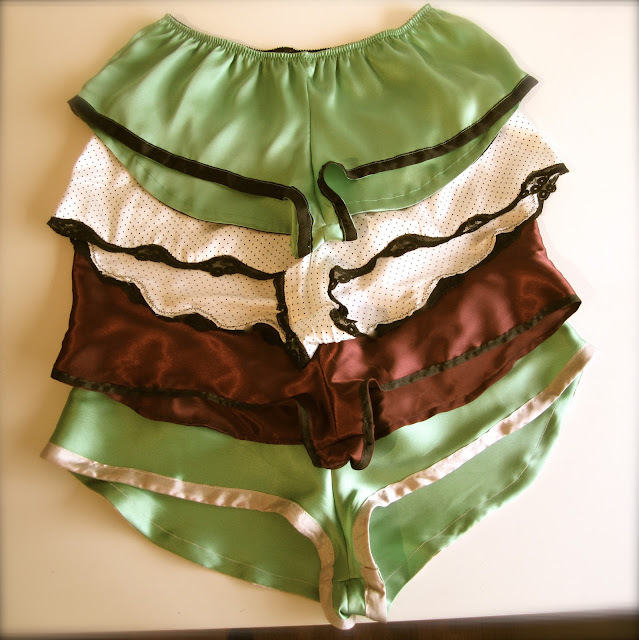 I've been meaning to sew myself some cute vintage knickers! Done! Love everything that you both do, very cute pattern! Beautiful! I follow you both. Oooh, ohh, me me. I JUST started learning to sew and everything! Those knickers are really cute. I've always wanted to try one of her patterns. Already a follower and liked Mrs Depew's FB page. I already follow you and I now like Mrs. Depew on Facebook! Love the pattern! Those are such cute knickers!